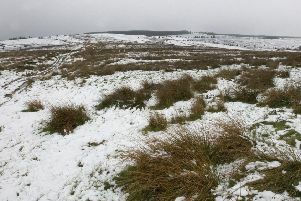 Snow at Carter Bar today. Spring might have sprung, but winter made a comeback in parts of the Borders last night, April 2, and into today. The clocks going forward at the weekend didn’t stop the weather going backwards a season. Heavy snowfalls were seen in parts of the region including Carter Bar on the English border and in Berwickshire, leading to a yellow weather warning being in force until 10am today and council gritters being deployed on affected routes. No further snowfalls are forecast, so today’s might well turn out to be this winter’s last hurrah. Temperatures are expected to reach 7C or 8C tomorrow and to hit double figures on Friday and over the weekend in parts of the region.